This fresh burrito bowl is a complete meal in a bowl. Fresh crunchy vegetables, quinoa, black beans and optional chicken drizzled with a zesty avocado cream bring all the flavours of the Southwest to your weeknight dinner table. Is there anyone who starts seeking inspiration for dinner ideas at 5 p.m. (or what I used to call “the crying hour”)? Nope. We all want to be w-a-a-ay beyond that stage when we’re hungry. 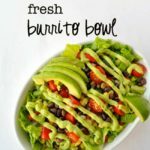 This Fresh Burrito Bowl is a quick meal that you can easily customize to your liking by swapping in or deleting some ingredients. Don’t like quinoa? Use rice instead. Like meat? Add some chicken. Choose your sauce to top it off, or make both the Chipotle Crema and the Avocado Crema and offer a choice. Want it dairy-free? Choose the Avocado Crema instead. It’s also a meal you can prepare the night before. 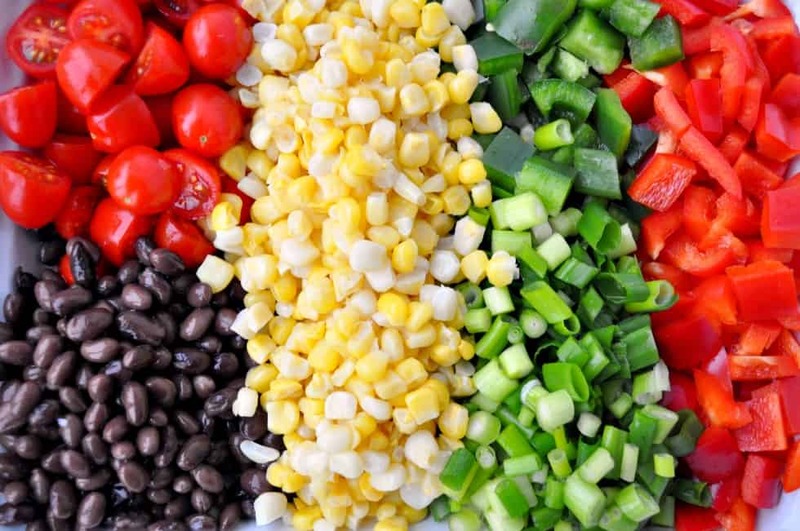 Just have all the fresh ingredients chopped and stored in the fridge and ready to assemble for those busy weeknights. Feel like Martha. Fresh, full of flavour, loaded with healthy protein, lots of crunch and topped off with a creamy piquant sauce, this is simply a bowl full of antioxidants. We voted, and even though I am usually a huge fan of chipotle, the Avocado Crema won, HANDS DOWN. 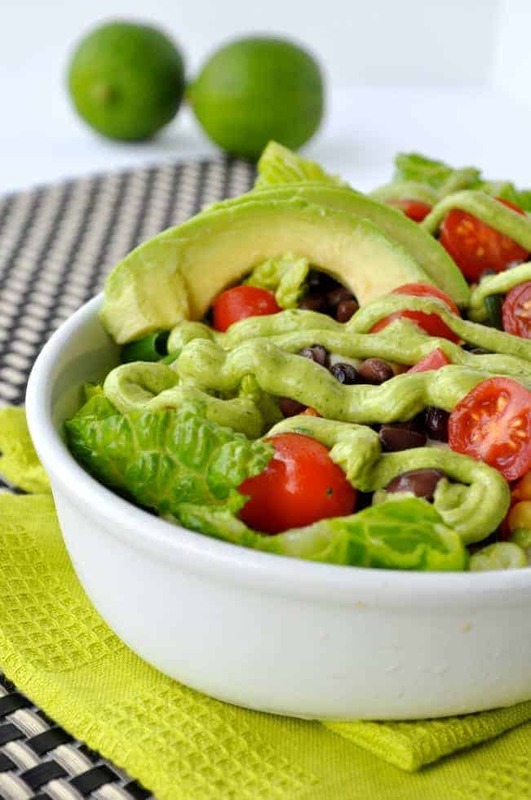 That dreamy creamy drizzle of avocado, lime and cilantro takes this meal from good to great. 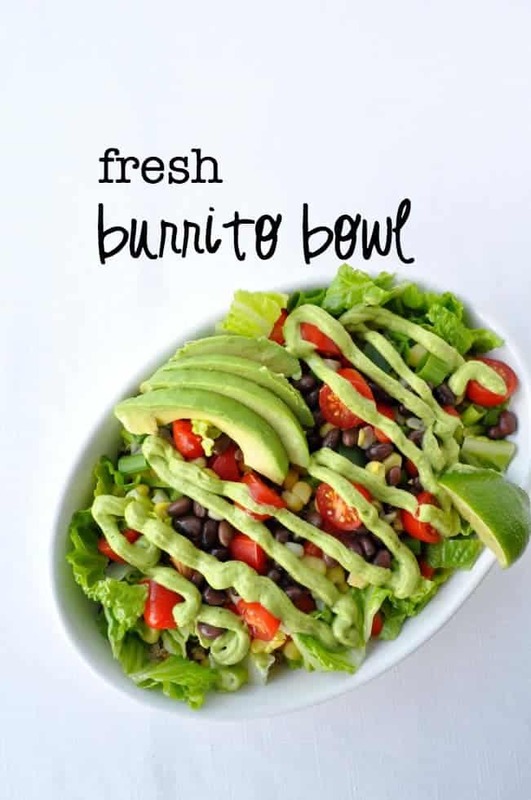 A super fresh and flavourful burrito bowl made even healthier by adding quinoa. This makes a great weeknight meal that can easily be adapted to your family's tastes. Cook quinoa, then set aside to cool. Mix with the salsa and put in the bottom of the serving bowl. Layer the remaining ingredients on top. Chipotle Crema--simply stir all ingredients together. 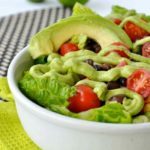 Avocado Crema--put all ingredients in a blender and blend until smooth. Love how just looking at your recipes makes me feel like making them. No crying hour required..I just see what you’ve got going. Putting together my menu for our Mexican fiesta night during Christmas break. Thanks. This will make an easy twist to my usual Santa Fe salad. Thanks! 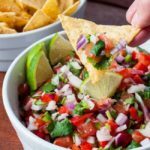 I think I might steal your idea for a Mexican night during the holidays! 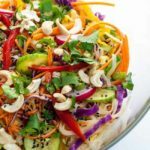 It’s an easy cuisine to make gluten-free and dairy-free. 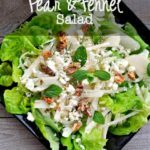 I have made many layered salads like this but the Avocado Creme on this is SENSATIONAL!! I used white balsamic vinegar and it had just the perfect bite to it. This one is a winner in my books! I know, I know!! We couldn’t get enough of it and started thinking about all the other dishes we could use it on. White balsamic is a great idea. 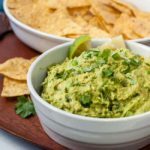 In your post it states to use chipotle crema and and avacado crema. I am not familiar with your recipes for these. I can assume to use chipotle and mexican crema but can you please give me the recipe for these? Thanks so much. I prefer pinto in lieu of black beans and maybe some grilled or rotisserie chicken if I don’t feel like cooking and look forward to trying. The ingredients for both chipotle cream and avocado cream are right under their titles in the recipe box. I’ll update the recipe to make it a little more clear. You can use one or the other, as you prefer. Rotisserie chicken is a great option for those busy nights! Thanks for your question.